I’ve been away from the blog for awhile…back in January, I was juggling so many things that I managed to get sick. I am one of those people who *never* gets sick (and by that I mean rarely, and usually a very mild case of whatever it is). So I was surprised when I was beset by the flu, not long after my last post. Then work, and travel, and my secret project (soon to be not-so-secret, and definitely not secret to those in the know). Fortunately I have people around who look out for me, so I had lots of hot soup and TLC to help me get well. I don’t expect to come back at full speed on the first day. A shock or shakeup can be a great excuse to make a change to my habits. Exercise helps me with more than fitness – it builds resilience – so I return to it as soon as I’m able. So now, as I get ready to take on a new and enormous challenge, I’ll be making sure I’m eating right, enjoying the process, being grateful every day, and working out to make sure I’m #FitToWin. Author WalkEatLivePosted on March 14, 2018 Categories Eat, Exercise, Fitness, Gratitude, Live, Walk, WalkingTags fitness, gratitude, Regent Park, success tips, Toronto, walking, wellnessLeave a comment on Are You Fit to Win? Starting the Day with Intention! This morning, a friend’s social media post (thanks, Rick Nason!) reminded me about why I love living an intentional life. I get up in the morning, glad to face the day, whatever it’s bringing. First up: exercise – because I know it will set me up for a fantastic feeling all day. All the way along today’s 5km walk, I could feel inspiration for the day ahead, and I even got a small reminder of what I don’t want, when we passed Sugar Beach and the Redpath elevators. A giant sugar freighter was unloading, and though you’d think being surrounded by the smell of sugar, the taste of it in the air, would be lovely…it wasn’t. But it was an excellent reminder to take with me through the day. Here are some snaps I took along the way; remember to do your best today, and do all you do, on purpose. Author WalkEatLivePosted on June 28, 2017 July 10, 2017 Categories WalkTags fitness, health, intentionalliving, positive thinking, purpose, Rick NasonLeave a comment on Starting the Day with Intention! What does nearly 4.5km look like? One of the most interesting things about wearing a FitBit is figuring out how far you went on that early morning or after work walk. When I tell many people that most days I log 4 to 5 km every day before starting work, they think that’s overwhelming. It sounds so far. In reality, it’s about an hour of brisk walking. To put it into context, it means I can do a loop from my house, down through the Distillery District, over to the east near the St. Lawrence Market, and complete the square by coming along Dundas Street. I love to record the sights and sounds I encounter, the changing light, and even the weather, with quick snaps from my phone along the way. I’m no professional photographer, but it’s okay with me if the photos are a little bit imperfect – usually our memories are, as well. Looking back at these photos reinforces why I walk – it’s not just about the fitness. It’s also about connecting with neighbourhoods and nature. I love how every time I take a walk, even if it’s a route I’ve covered before, I’ll get a perspective that’s just a little bit different. I might see a building from a new angle, or spot a change in a shop window. Maybe a quirky sculpture will appear where I haven’t seen it before. Or possibly the visual will trigger a memory of something my husband said while we were making our way through that section. Other times, I snap because there’s something I want to look up or investigate when I get back home. Taking these little shots along the way also gives me something to share with friends and family who don’t live close by. That way they can share the memory, even if they aren’t able to be here with me in person. I like to see the subtle changes that occur in familiar settings, like how the tables in the outdoor cafes and bistros are taking on a summery appearance that they didn’t have, even a month ago. Seeing something like this park, where I’ve been many times, from a different vantage point, means I notice the expanse of grass, and how green it is. Later in the summer it will be tired and yellowed – it won’t have that early season freshness that is just here for today. Coming up through the market, I can compare photos from this time last year, and see alterations to the skyline. Even the market itself is getting refreshed, with a new market building being erected to the north of where this iconic South Market stands. Vendors from the North Market are currently in one of those giant white tents that you may have seen for temporary installations near you. I am also sometimes surprised by the low-hanging cloud cover, and I wonder whether this is only noticeable because the buildings keep getting taller and taller. All of these thoughts, as well as plans for my day, new ideas for writing or speaking, or working through challenges, happen while I’m making my way along the sidewalk. Next time you’re out for a long walk, take time for a photo or two – you might be surprised at what you do and don’t remember about the pictures you’ve made along the way. Author WalkEatLivePosted on June 5, 2017 Categories Relaxation, Walk, Weight LossTags 4km walks, fitness, photography, Toronto, walkingLeave a comment on What does nearly 4.5km look like? In order to fit in all the elements that make for a successful morning, sometimes we want a fast, easy-to-make breakfast. The easiest thing might seem like grabbing a muffin or a bowl of cereal, but neither of those things is particularly healthy, even if they are fast. Lots of sugar, sodium, and fat go into the average cereal or breakfast muffin, and not enough vitamins, minerals, and fibre. Instead, opt for a healthy smoothie like this one! Author WalkEatLivePosted on May 3, 2017 Categories Breakfast, Eat, Fruit, vegetablesTags fitness, fruit, healthy eating, smoothies, Toronto, vegetablesLeave a comment on Green is Good! It’s great to see that holiday weight coming off – and three things are responsible: planning, effort, and patience. The planning part is twofold: meal plans, and scheduling daily exercise into the routine (and pushing that with extra weights and stretching). Those who know me already know that I am an avid walker, daily, but I may forget to include weights…but then I saw a photo of how great my arms looked a couple of years ago! Meal planning is truly the centre of it all. It keeps me from buying what I don’t need, and I double-check for things that are key to health: calories, fibre, low sugar, low sodium. 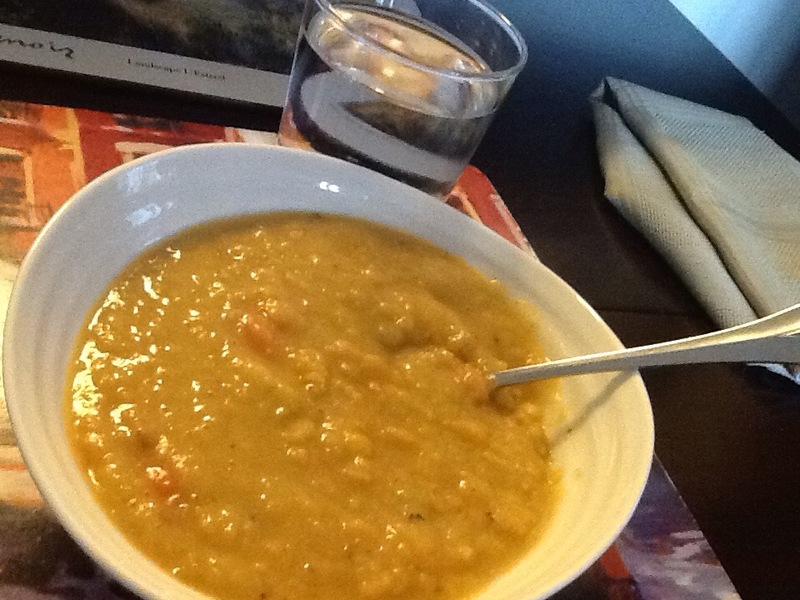 This no-salt vegetarian pea soup is a great example. Breakfasts are similar most days: smoothies, oatmeal, homemade granola, and sometimes eggs. Lunch? Leftovers, soup, or salad. Here’s the dinner menu we’ve been eating this past week – the tofu is a new try from Vegetarian Times. It’s important to incorporate new choices that fit your new lifestyle, but wholesale swings to an unfamiliar diet are frequently a recipe for disaster. Take your time, and make good changes every day. We are not vegetarians, nor vegans, but we recognize that a plant-based diet is the way to better health, better use of the Earth’s resources, and it’s absolutely better for the animals. We have slowly migrated from one vegetarian day a week to alternate days, and planning four plant based dinners helps keep us on track. While I have your attention, don’t forget that #BellLetsTalk day is this week – let’s be sure to make time for self care on the mental health front everyday also – and please reach out to someone today and let them know you’re there for them. What changes have you made for better physical and mental health in 2017? What if someone gave you a fabulous new vehicle, that was capable of doing virtually anything you could imagine? Further, what if they told you that as long as you took good care of it, it would last for the rest of your life, and it would carry you anywhere you wanted to go? Guess what – you’ve got it! It’s your own body. Take good care of it and it will carry you in style to the end of your days. I know there are exceptions, sometimes bodies let us down, through no fault of our own. Illnesses and conditions can make our physical performance less than optimal, compared to others. That’s the great thing, though. When it comes to your own human health and performance, you don’t need to measure up to anyone but you. If you’re having trouble fitting fitness into your schedule, try working it in a little at a time. Make sure you make a commitment that you can keep. For me, for example, I know very well that if I plan to work out first thing in the morning, no matter how early, the odds are better that it will happen. If I try and leave it to the end of the day, life seems to have a way of intervening. Other tips for making sure you give your fabulous vehicle the care and feeding it deserves? Try something you’ve never tried before, just once – who knows, you might like it! Have fun, get fit, and here’s to your health. You’ll be grateful when you feel great every day. Right out of the gate most mornings, we walk or go to the gym. Not a leisurely stroll, but a brisk pace, almost a run. Himself having longer legs, I have to work a little harder to keep pace. Then, back home, we have breakfast before setting to work on the day’s tasks. Once in a while our schedule means we don’t get the walk in until later in the day, and when that happens, we notice a difference. Keeping fit and eating good food, prepared from scratch gives us energy and we feel sharper and better able to cope with the day – however it turns out. We’re grateful we can afford good food, but we have also found that eliminating processed food from our diets isn’t any more expensive, especially if we plan our meals and avoid waste by using what’s on hand and buying just what we need to round out the menu. This tasty oatmeal is made in less than ten minutes using large flake or steel cut oats. Cook on the oatmeal setting, or alternately, 3 minutes on full power plus 5 minutes on 50% power. Enjoy with milk or nut milk if you prefer, and a little maple syrup. We’re always reading and exploring information about healthier food choices. One really interesting documentary we watched this week is Forks over Knives, which presents a case for a whole food, plant based diet. While we haven’t thrown away all our food and started fresh, we were already proponents of eating real food, prepared at home. Our first step on the journey is to return to eating far more fruits and vegetables, and to reduce the prime position animal products are taking on our table. So why feature these breakfast eggs in today’s post? Eggs Benedict are an old favourite of ours. We’ve eaten many, and fed them to our friends. But this is definitely a healthier option. These poached eggs are served on a whole grain buckwheat English muffin loaf, which is topped with mashed avocado. Hothouse tomatoes are on the side. What could we substitute next? Perhaps some cooked mushrooms and chickpeas? Watch this space for more healthier food choices. Meanwhile, this is as good as any Benny, and moving us in the right direction. For the first day in what seems like ages, we aren’t getting our exercise by chucking hundreds of kilos of snow and ice around. But all that “necessary exercise” has made us feel fitter and more able to push ourselves during our regular workouts, as we return to normal. Not only that, but local spring veg (albeit indoor-grown) are making an appearance to give us hope. This morning, homemade whole grain bread topped with local cream cheese, sliced tomato and cucumber, a poached egg, and a little chipotle powder to wake up the taste buds. Thanks to Denise MacLean pottery for making the beautiful mug! Author WalkEatLivePosted on March 23, 2015 Categories Breakfast, eggs, Exercise, Gratitude, Healthy Eating, Lent, vegetablesTags eggs, fitness, Halifax weather, health, local food, Nova Scotia, spring1 Comment on Good Habits Die Hard! …from making real food at home. Today’s breakfast is whole wheat toast with jam we made last summer. Beside it, eggs scrambled with local farm peppers, mushrooms and celery, flavoured with tarragon and chives from our own garden. Today is off to a fantastic start!